Notes Susan Stern, “every aspect of your marketing plan should have a common and consistent theme across-the-board: overall color, design and appearance of all things communication that your company promotes. This is not a do-it-yourself project.Only a competent Omaha marketing consultant has the tools and industry knowledge to streamline a company image at a professional level. “I am one of the only Omaha marketing consultants in town that handles all things communication on & offline.Most Omaha advertising and marketing firms have up to 5 (five) people managing your company image. That means, behind-the-scene, one person handles the copywriting, another does the graphic design, and most likely other tasks such as Omaha website design & development are outsourced with high costs passed onto you. With so many people working on your image branding, that can present a problem in terms of image consistency, too. 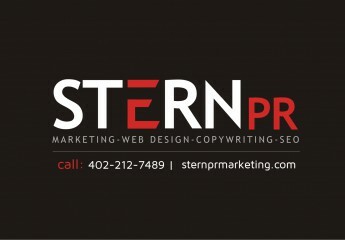 “With Stern PR Omaha, you have solely 2 (two) professionals managing your marketing! Costs are very reasonable. Your image remains consistent. Reaching Susan Stern to communicate is easy, too. Pick up the phone, send an email or text. Yes, image is almost everything to a business, but not the end-all-be-all. Yes, a company’s image can help customers remember your business, but the quality of the image is what makes a lasting impression. In other words, a fantastic logo on a business card will have little influence if the card paper itself looks cheap. The quality of your business card image portrays to customers on a conscious & subconscious level. Therefore, a low quality image on your business card represents a poor quality company. Likewise, a polished biz card which contains a great looking logo and easy-to-read font and all contact information positioned on superior paper stock gives an outstanding impression of your business. A successful brand identity is based on SO MUCH MORE than just a talented designer’s or copywriter’s interpretation of your company. Branding strategy must capture the essence of the company’s vision and summarize the benefits that your target demographic will experience when doing business with you. “Here at Stern PR Omaha, not only will my clients receive meticulous branding of your company image on & offline, but the image will be consistent, streamlined and professional, backed by superior customer service, affordable rates and an advocate who works on your behalf within your budget,” emphasizes Susan Stern. For more information and inquiries, please contact Susan Stern direct in Omaha at (402) 212-7489. Visit official website here. Website Design Omaha – All Marketing On & Offline. 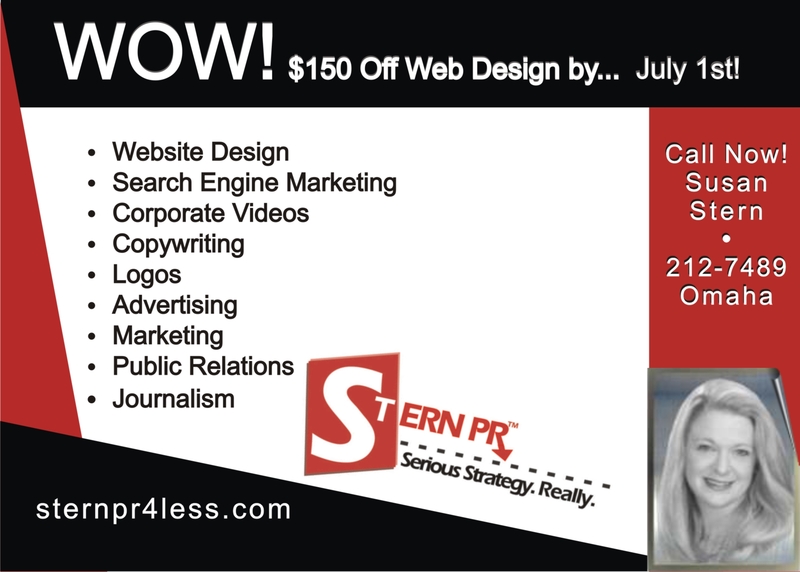 What sets apart | Stern PR | Omaha website design from the rest, is easy to see. Omaha website designers tend to be technical. They are not professional copywriters nor handle broadcast Cable/TV internet video commercials NOR photography. Stern PR in Omaha handles it all. Advertising, Marketing, Public Relations & Journalism. Stern PR. Serious Strategy. Really! Pin the tail on the donkey. Can you hit the mark? A keen Omaha business owner knows website rank and look are equal to the brick-and-mortar image of business – on the ground. “Your website’s design, its search engine rank and user-friendly navigation are vital to online success. It’s important to connect with customers, build relationships while increasing online traffic and revenue,” emphasizes Susan Stern, Stern PR an Omaha Marketing Consultant. Tip # 1. Your website must be found high, preferably on 1st page of Google, Bing and Yahoo. It’s called keyword local search relevance. The process of achieving the desirable page rank requires regular, monthly website content maintenance by a pro. A ‘Monthly SEO Plan’ is your best bet. Tip # 2. Website design shouldn’t be too busy. A company website must be clean and modern, integrate appropriate widgets while offering quality navigation, descriptive copywriting and eye-catching graphics and video for aesthetics and SEO. Also. ‘Just Say No’ to all flash websites. Only flash headers (a home page banner) with text in body are effectively read by search engine algorithms. Finally, but not the end all, be all – website visitors must reach your business easily. Example: via contact form, email access, telephone number and so forth. It should never be difficult to contact your company right now! Tip # 3. Marketing needs to be done right, not do-it-yourself. “Of course, to reach the pinnacle online Search Engine spot, you have to invest your marketing budget on either one of the following scenarios. hire an Omaha marketer who knows all available marketing options. The last option, outsourcing marketing, is the most affordable and highly effective solution. Take note, you will want someone who provides regular website content/social media writing, directory updates and more. The best thing to do is invest in a – Monthly SEO Plan,” states Susan Stern, Stern PR an Omaha SEO and copywriter professional. Tip # 4. Ask your Omaha marketer to issue quarterly performance reports, and include research/analysis in the Monthly SEO Plan. Both are important to track the effectiveness of any SEO campaign. “At Stern PR here in Omaha, my developer Austin and I pow wow with the client during a conference call to ascertain a company’s on & offline objectives. Then, in person I present a written quote, which includes a recommended course of action, strategy, the investment cost and project scope. A budgetary commitment to marketing is worth its wait in gold. I offer personalized service, image consistency and affordability” notes Susan Stern. All in all. Step 1 – through 4 are must-have’s – necessary for online & offline marketing success aimed at connecting with customers, building relationships and boosting profits. For Omaha Website Design and marketing consultant inquiries, please contact Susan Stern Stern PR.